I'm producing a podcast (or trying) and I've hit a few technical hurdles that I'm having trouble overcoming. 3. Record all system audio, and skype conversation to disk. 4. take all the audio, me, my partner, my computer etc and stream it on UStream live. Now how exactly to I get to my goal with the equipment that I have? I do "live" once in a while. although I haven't in a some time. the biggest problem is trying to make one computer do everything. it's not always a good idea because if that crashes hard you don't have a show. having grown up in an "analog" my setup is mixer board centric. 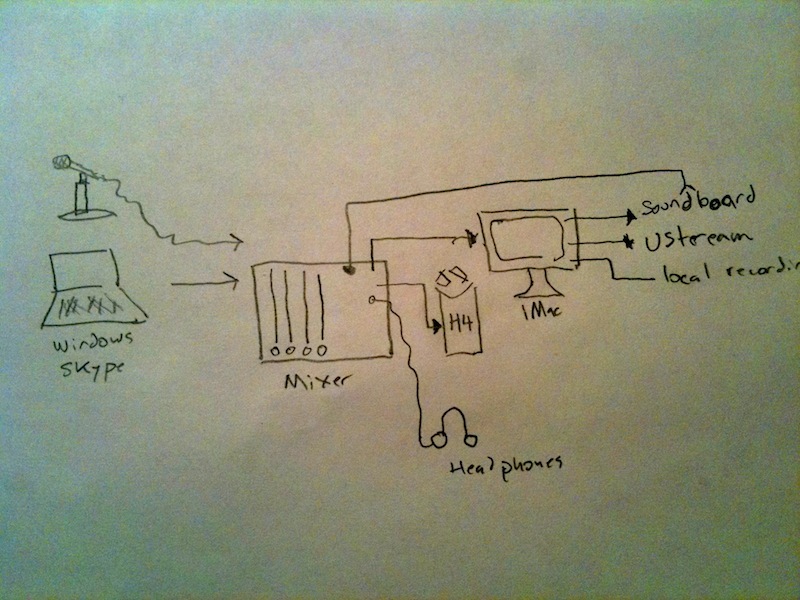 here's a diagram of how I would set this up. from the output of the board we have three things. one is the master mix to the Mac for broadcast to uStream and for capture, another is going to your backup recorder like an H4, and the third is the aforementioned Alt Mix for the Skype computer. notice that headphones are connected to the board. this is the best place to hear that because there is no delay in the mix. it's all there. guest, noises (from SoundBoard) and you. the Mac, because it's just doing streaming and capture shouldn't need to run Audio Hijack or Sound Flower. just select the Mic In or use an audio interface for better sound. this means you can run SoundBoard without it showing up twice in your audio. we did two or is it three shows on this very subject. check out the Mackie 1202 and Great Skype on KnowTech.TV. oh the third was on Audio Interfaces. so looks like i need to invest in a analog mixer.. darn i was hoping i didn't have to spend much more money. but thanks for the detailed reply. should help a bunch! you don't have to but it certainly makes things simple. I'm all about using the right tool for the job. and the analog mixer, at least for my productions, has been the thing that has consistently saved the day. the 1202 that we did the show about is something I've used for the last 16 years. and only recently have I had a need for a bigger board. which isn't a big board just the next board the line (a 1402 not a 1604). I'm sure that there is a way to make what you want to work using your hardware. but you will run into the day when you need to add the 2nd (or 4th) microphone. or you'll want the 4 fourth output. that will be the day you will say, "dang, I should have got that mixer last year! this would be so much easier." boards are cheap. there are Mackie new 2 and 3 channel boards that aren't expensive. or look at the Beringer line. there is very useable boards there for much cheaper. some "audio professionals" cringe at the thought of this companies products but we've found good things there. just remember the basic rule of board: a bigger board is not always a better board. the second rule of board is that: simple rules. don't buy into the VFX add on. you will never use it. Shouldn't SoundBoard be able to take the place of the analog mixer? If not i believe there is an Ambrosia solution that would. Sound Board is an app that you can use to play or insert specific sounds into your performance. think of it as a DJ Cart system. or what every morning show has in front of them to play fart sounds on command. its a useful app to be sure. hook it up with one of these Korg nano keyboards for a complete intro/outro control. I would use this for Beer School to do the crowd intro, bell and other sounds that get inserted in post. having this would mean one less thing to do or keep track of later. Audio Hijack Pro might be able to replace a board in certain circumstances. although if the routing is complex, like if you have to work with a phone patch, you will end up needing a board. if the inputs to outputs are limited then certainly AHP will make a board unneeded. it remains to be seen how easy it is to set levels. with an analog board all channels have knobs or sliders that you can reach to adjust levels on the fly. but the few screen shots I've seen indicate that this is not so easy in software. maybe I'm missing something. Thanks for the correction. i have Audio Hijack Pro, and that's not what i was thinking of. Checking the website i was thinking of [WireTap Anywhere. If i read the description correctly it should be able to handle routing whatever to where ever. for a $130 you are well on your way to a nice board. WireTap Anywhere assumes that you have a recording tool like Logic or Sound Track for capture. which is fine. but on my first glance it looked like it will multi track record on it's own. but it is not. making it seem like a lot of money for the functionality for virtually hooking this to that.